These Tilt and Turn windows provide an ideal solution for high-rise applications where internal glazing and ease of cleaning are essential. Premium Tilt Before Turn windows are thermally efficient, secure and versatile. Suitable for all: Commercial, Retail, Residential, Public, Health Care and Educational applications. 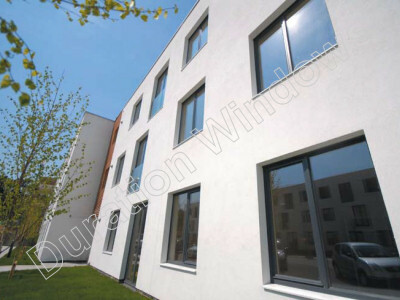 They feature contemporary flat faced profiles, all internal beaded for added security and ease of glazing on site. Our Premium Tilt Before Turn windows have a polyamide thermally broken profile and comply with doc L of the Building Regulations for both new build and replacement and refurbishment projects. They can achieve U values as low as 1.3W/M²K (with triple glazing) and a Window Energy Rating ‘B’ with Double Glazed sealed units. The glazing beads can be square or chamfered and there is a choice of a 58mm or 70mm deep frame to accommodate varying applications. Max. heights and widths are based on a sash windows with equal splits. These Aluminium Windows meet Doc. L of the building Regulations by achieving a Window Energy Rating of 'B'. The above statistics apply for: Double-glazing, 90% argon filled Swiss V spacer bar (low-E, en=0.05, soft coat), 20mm or more ( U Value centre Pane - 1.221 W/M2K Glass, g = 0.74 *). Please ask our technical department for information on U-Values, as it may differ depending on your chosen frame, vent and glass. ** Please ask. Can be specified for domestic or commercial applications. Excellent weather performance/ratings in accordance with the requirements of British Standards (BS6375, Part 1: 2004). Your sight-lines will depend on your chosen vent, transom and outerframe combination. For more details see our Section Identification. Please view this document and then contact our technical department for more information.